A total of 5,190 fatal work injuries were recorded in the US in 2016, a 7-percent increase from the 4,836 reported in 2015, the U.S. Bureau of Labor Statistics reported this week. 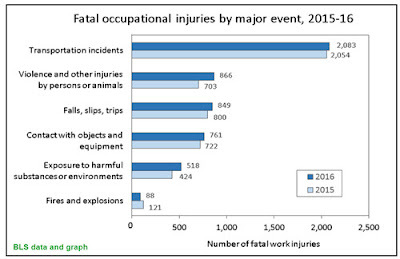 This is the third consecutive increase in annual workplace fatalities and the first time more than 5,000 fatalities have been recorded by the Census of Fatal Occupational Injuries (CFOI) since 2008. The fatal injury rate increased to 3.6 per 100,000 full-time equivalent (FTE) workers from 3.4 in 2015, the highest rate since 2010. Some 36 states had more fatal workplace injuries in 2016 than 2015. Work injuries involving transportation incidents remained the most common fatal event in 2016, accounting for 40 percent (2,083). Violence and other injuries by persons or animals increased 23 percent to become the second-most common fatal event in 2016. Two other events with large changes were exposure to harmful substances or environments, which rose 22 percent, and fires and explosions, which declined 27 percent. Fatal work injuries involving violence and other injuries by persons or animals increased by 163 cases to 866 in 2016. Workplace homicides increased by 83 cases to 500 in 2016, and workplace suicides increased by 62 to 291. This is the highest homicide figure since 2010 and the most suicides since CFOI began reporting data in 1992. In 2016, fatal injuries among transportation and material moving occupations increased by 7 percent to 1,388, the highest count since 2007 and accounting for more than one-quarter of all work-related fatalities. Occupations with increases greater than 10 percent in 2016 include food preparation and serving related occupations (64 percent); installation, maintenance, and repair occupations (20 percent); building and grounds cleaning and maintenance occupations (14 percent); and sales and related occupations (11 percent). Declines greater than 10 percent include healthcare practitioners and technical occupations (19 percent), military occupations (15 percent), and production occupations (14 percent). Logging workers continued to have the highest fatal injury rate in 2016, at 135.9 fatalities per 100,000 FTE workers. The number of fatalities among loggers increased from 67 in 2015 to 91. Asian, non-Hispanic workers incurred 160 fatal injuries, up from 114 in 2015, which was the highest percentage increase (40 percent) among any race or ethnic origin. Black or African-American, non-Hispanic workers also had a large percentage increase (19 percent), with 587 fatal injuries compared to 495 in 2015. The rate of fatal injury for both groups also increased. Hispanic or Latino workers had 3 percent fewer workplace fatalities in 2016 with 879 fatalities, down from 903. Foreign-born workers make up about one-fifth of the total fatal work injuries. Thirty-seven percent of these workers were born in Mexico, followed by 19 percent from Asian countries. Workers age 55 years and over had 1,848 fatal injuries, the highest number for this cohort since CFOI began reporting national data in 1992. In 1992, workers age 55 and over accounted for 20 percent of fatalities; in 2016, they accounted for 36 percent. These workers also have a higher fatality rate than other age groups. The number of workplace fatalities in private industry increased 7 percent in 2016. This was led by an increase in service-providing industries, which were up 13 percent to 2,702 from 2,399. Fatal workplace injuries to government workers increased 9 percent overall to 497, with a 9-percent decrease in federal employee fatalities that was more than offset by increases in state and local government fatalities, up 20 percent and 13 percent, respectively. Fatal injuries in the leisure and hospitality sector were up 32 percent (225 to 298) and reached an all-time series high in 2016. This was largely due to a 40-percent increase in fatal injuries in the food services and drinking places industry from 118 to 165. A total of 36 states had more fatal workplace injuries in 2016 than 2015, while 13 states and the District of Columbia had fewer; Wyoming had the same number as 2015. See the BLS news release with charts here (pdf). Review BLS fatal injury data for 2015. Browse Fall Protection safety signs and labels. Review Trucking and Transportation placards and signs. ComplianceSigns Digital Safety Scoreboards display your safety record.